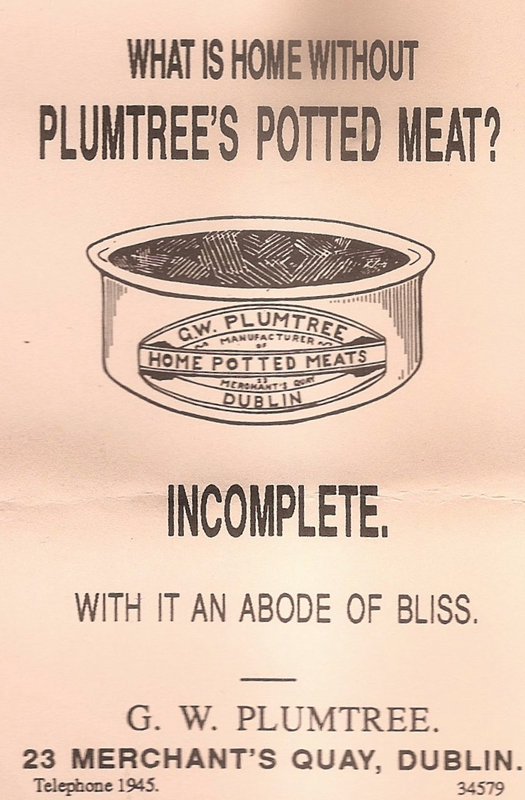 'When it came to writing slogans James Joyce proved himself no slouch. That's a claim made on a wonderful advert for Guinness printed in the Irish Times on Bloomsday in 1982, Joyce's centenary. I was one of hundreds of Joyceans in Dublin for the celebration, and I bought a copy of the paper. -- Give it a name, citizen, says Joe. -- Wine of the country, says he. – What's yours? says Joe. -- Health, Joe, says I. And all down the form. Ah! Owl! Don't be talking! I was blue mouldy for the want of that pint. Declare to God I could hear it hit the pit of my stomach with a click. The Guinness advert has another quotation from the same episode. Terry the barman is bringing a 'pony' (a half pint) to Little Alf Bergan. -- Hurry up, Terry boy, says Alf. Terence O'Ryan heard him and straightway brought him a crystal cup full of the foaming ebon ale which the noble twin brothers Bungiveagh and Bungardilaun brew ever in their divine alevats, cunning as the sons of deathless Leda. For they garner the succulent berries of the hop and mass and sift and bruise and brew them and they mix therewith sour juices and bring the must to the sacred fire and cease not night or day from their toil, those cunning brothers, lords of the vat. Bungiveagh and Bungardilaun are Edward Guinness, Lord Iveagh, who ran the brewery, and his older brother Arthur Guinness, Lord Ardilaun. 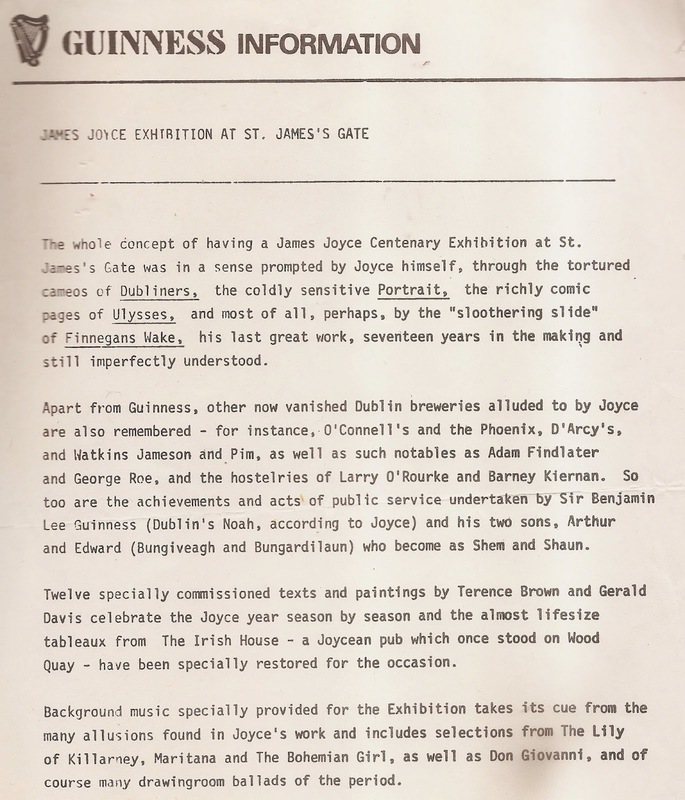 The exhibition, which I visited on Bloomsday, recreated a Dublin pub bar of Joyce's day (using bits of counters rescued from defunct pubs, like Barney Kiernan's) and an iron fireplace where the canvassers in 'Ivy Day in the Committee Room' set their bottles of stout, waiting for them to open with a 'Pok!' (Has anyone ever managed that trick?). There was also a fine performance of Joyce readings by the Dublin actor Dermot Lynskey. In fact, the proof that Joyce wrote this slogan is in Finnegans Wake. The 'frothy freshener' appears in the 'Haveth Childers Everwhere' episode, published as a book by Babou and Kahane in 1930 - just a year after the first 'Guinness is Good For You' ad came out. 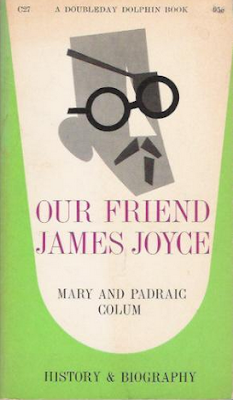 Joyce wrote 'froh', which is German for merry, rather than the 'flow' in the Guinness version. HCE says 'free, froh...frothy' because he has a guilty stammer. The name Dublin itself comes from dubh linn 'black pool'. This was where the Poddle stream met the River Liffey to form a pool. So Dublin and Guinness Porter are related linguistically as well as geographically! They did, Padraic, they did! 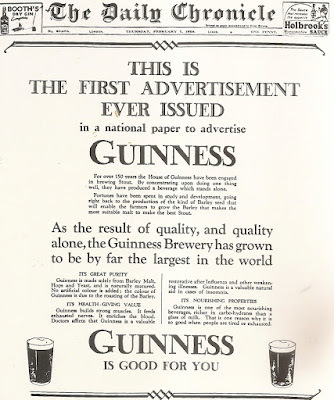 Joyce's disappointment that Guinness didn't use his slogan can only mean that he suggested it to them, or that he expected them to discover it for themselves when Haveth Childers Everywhere was published. 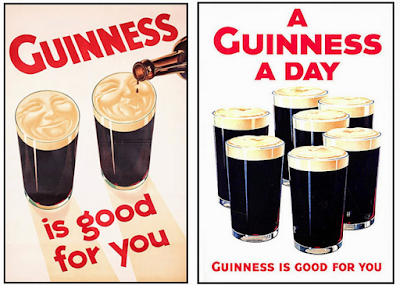 Either way, Guinness didn't invent the story as a publicity stunt. 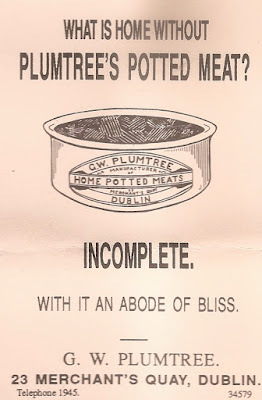 Here's the most famous ad in Ulysses, from a recreation of the Evening Telegraph published by Split Pea Press in 1990. 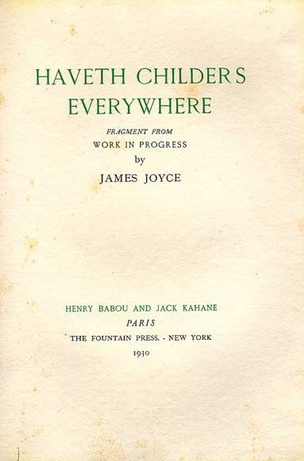 The slogan was invented by Joyce. While writing the Wake, Joyce read the Irish and British papers daily, taking notes for his book. He was often more interested in the ads than the news stories. The very first notebook for the Wake includes newspaper ads for Bird’s Egg Substitute cake-meal (‘a tin with a purpose’), for Hustler soap and for the Colgate Shaving Stick (See Robbert-Jan Henkes great article on the Wake's origins here). 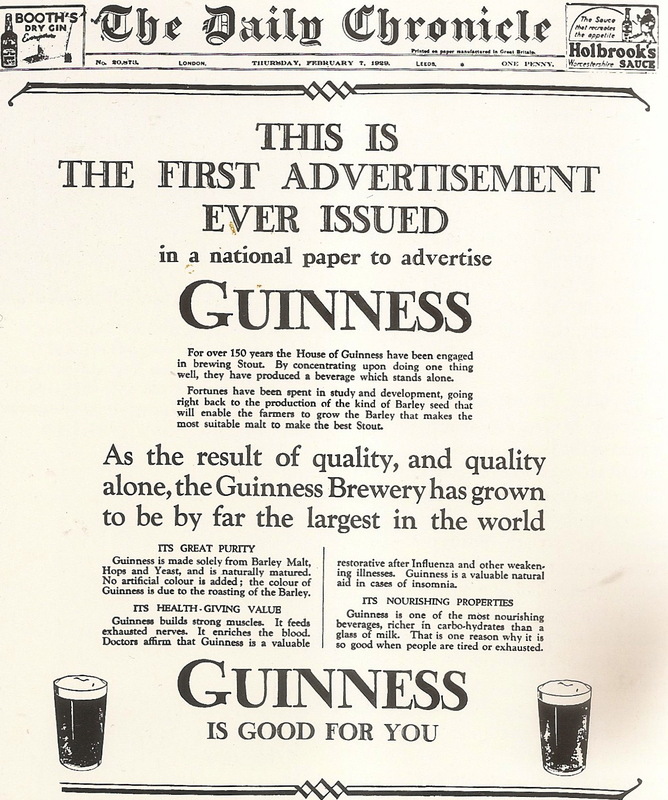 So Joyce would have been interested when Guinness launched their first ever advertising campaign in 1929, with the slogan 'Guinness is Good for You'. He might even have taken it as a challenge. 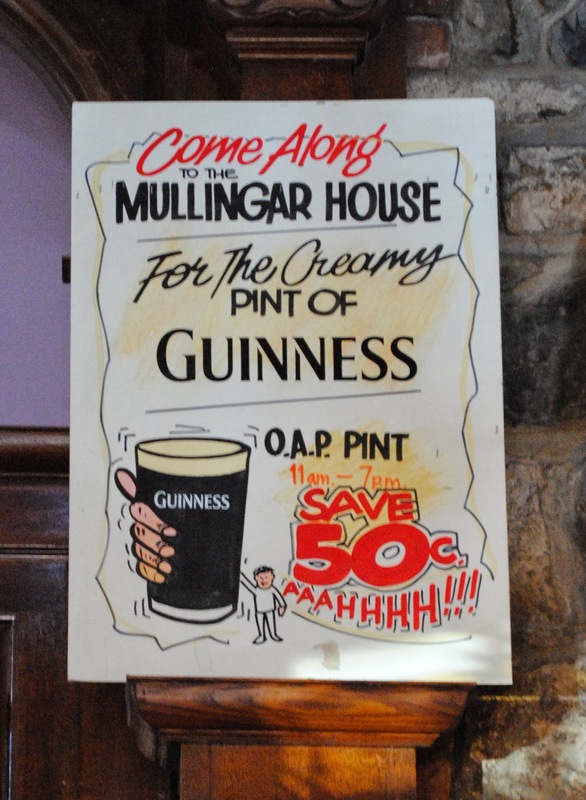 Soon after, John Gilroy's colour posters appeared. Joyce put that into the Wake too. Here's a perfect pint of Guinness, from John Kavanagh's ('the Gravediggers') by Glasnevin cemetery. It has a creamy rather than a frothy head. 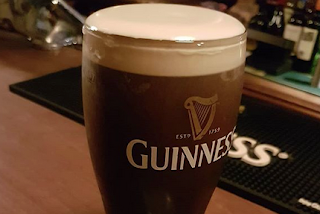 This thick creamy head was created in 1959, when Guinness brewer Michael Ash had the revolutionary idea of adding nitrogen to the draught beer. Nitrogen's tiny bubbles create a head so dense that bartenders can now draw a shamrock on top. 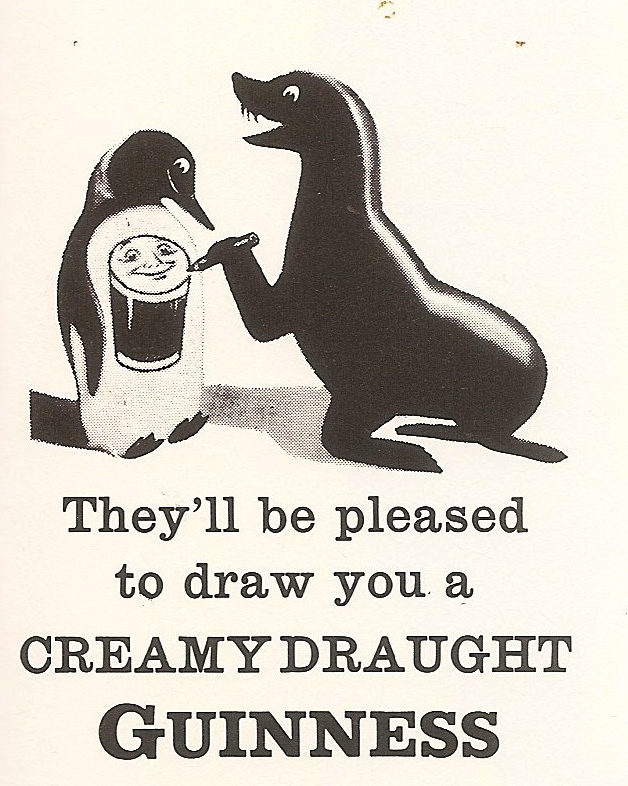 After 1959, Guinness ads described the keg version as 'creamy'. 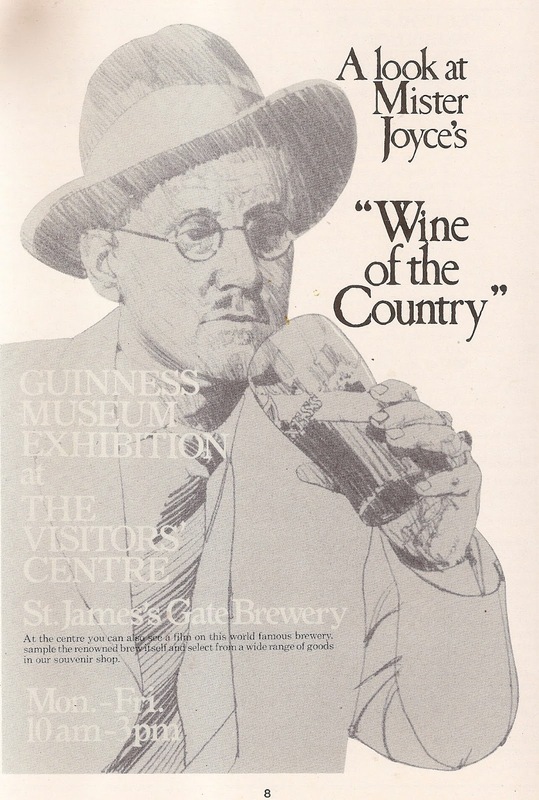 When Joyce wrote his slogan, Guinness had to be poured from two barrels, a method still used in the 1970s to pour plain porter, a weaker version of the stout (celebrated by Flann O'Brien's 'a pint of plain is your only man'). 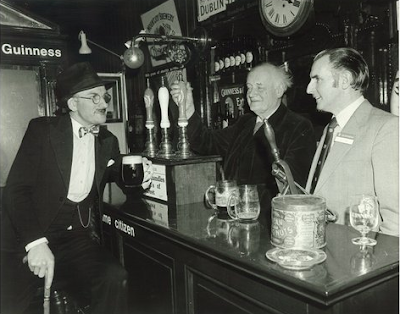 Here's a film showing the last pints of plain poured in Befast, in 1973. They have frothy rather than thick creamy heads. This froth could also be called foam, as in 'a crystal cup full of the foaming ebon ale' quoted above. 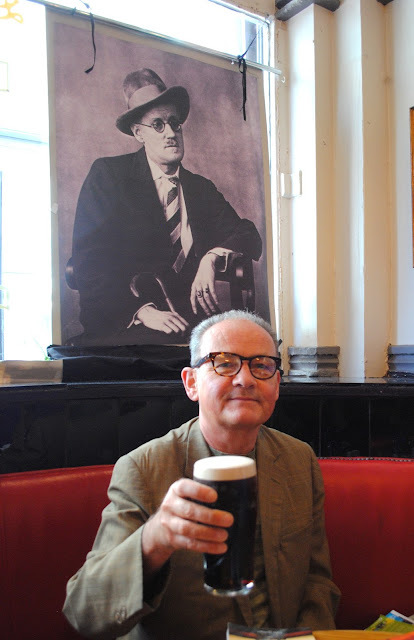 Twice in the Wake, Joyce calls Dublin beer 'foamous'. 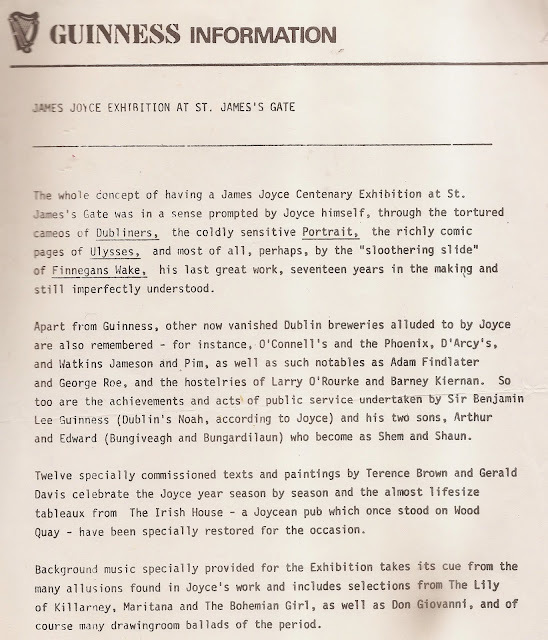 I learn from the James Joyce Digital Archive of Wake drafts that Joyce originally wrote 'the foamy freshener' before choosing the livelier 'frothy'. Maybe he should have thought of 'the foamous freshener'? 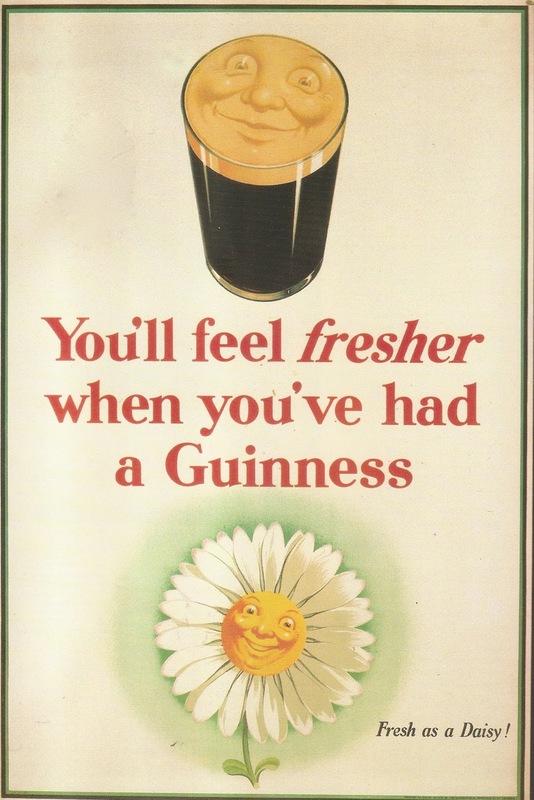 Anyway, Joyce was right to call Guinness 'frothy', and as for 'freshener', here's a 1937 Guinness poster. Did someone remember Joyce's suggestion? I think that Joyce's 'frothy freshener' was a very effective slogan. Since I started looking into this subject a couple of weeks ago, I've drunk nothing but Guinness; and every time I've ordered a pint, I've remembered the words 'the free, the froh, the frothy freshener'. But he, the young chief of the O'Bergan's, could ill brook to be outdone in generous deeds but gave therefor with gracious gesture a testoon of costliest bronze. Thereon embossed in excellent smithwork was seen the image of a queen of regal port, scion of the house of Brunswick, Victoria her name, Her Most Excellent Majesty, by grace of God of the United Kingdom of Great Britain and Ireland and of the British dominions beyond the sea, queen, defender of the faith, Empress of India, even she, who bore rule, a victress over many peoples, the well-beloved, for they knew and loved her from the rising of the sun to the going down thereof, the pale, the dark, the ruddy and the ethiop. One 1922 reviewer of Ulysses found the story of Lord Ardilaun and the lice deeply offensive. I come from Dublin (Clontarf) and I never knew until now that 'the creamy head has only existed since 1959'. I only learned that two days ago. It's a fascinating story. 'Figuring out how to streamline the process was a difficult enough conundrum (they called it the “draft problem”), that even after 20 years no one had solved it. Eventually, working with a keg designer, he did figure it out. He described it to us. “There were two parts. One part where we had to have a reducing valve, and one part for the two gases, nitrogen and CO2, high pressure, reducing valve, low pressure, flood the beer. 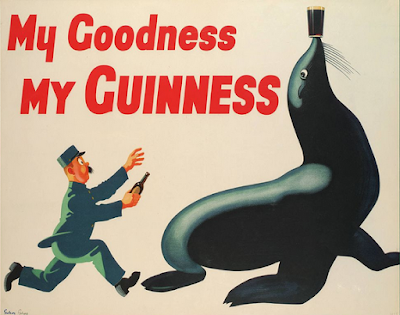 When we drew off the beer, the gas would come through the reducing valve giving you a constant pressure.” The keg went through two designs before Guinness started sending it out to pubs, rushing at the end to get the project launched by 1959—the brewery’s 200th anniversary.